The Packaging Store has earned a reputation for excellence for meeting your logistics needs for shipping freight and cargo. 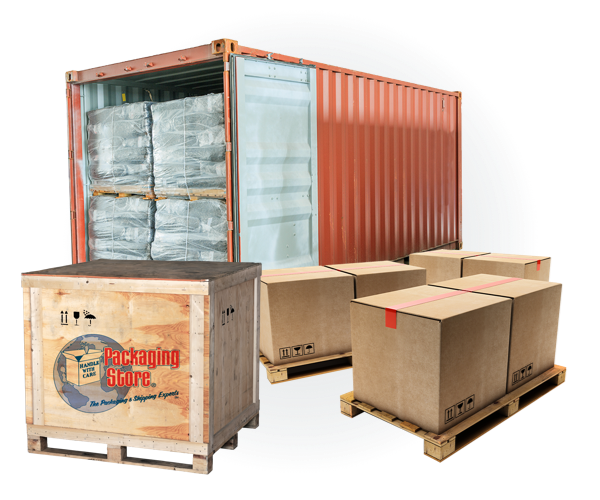 At the Packaging Store, we offer incredibly low freight shipping rates. Door-to-door or dock-to-dock, we ensure the safety of your shipment through custom solutions. Pair our freight solutions with our national and international order fulfillment, and you’ve got a one-stop-shop to meet all your business shipping needs. Shipping quotes from the Packaging Store are almost always a pleasant surprise. Low rates. Full service. We do more than low cost freight shipping. At the Packaging Store, we sweat all the small stuff so you don't have to. Customs forms, insurance, packaging and storage-we do it all. Call us up and we’ll even come to your warehouse or workplace and pack your items on site. Our international shipping solutions prepare your items to conform to any country's customs department requirements, including ISPM-15 lumber treatment services. With custom-designed crates and packages, numbered, bar coded and palletized crates, your shipments handled with care through the entire shipping process. We also believe in offering robust services like calculating shipping rates directly from the Packaging Store site. Get custom freight shipping rates from the Packaging Store and let us start making your life easier today!